The Ox tries to start the car, but it’s not cranking up. It seems that leaving the dome light on for a few hours was not such a great idea. We roll start the 5-speed and recharge the dead battery. In moments we are winding along Lake McDonald to Apgar Campground where our park shuttle awaits. Fortunately, we make it just in time for the 8:10am departure. The Ox, Red Eye, and I arrived in Glacier National Park yesterday. 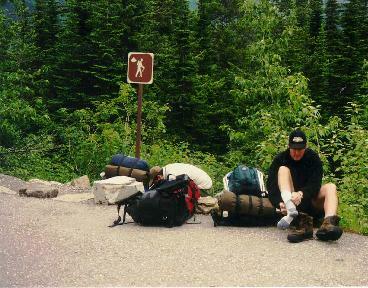 We received a permit to hike from the Jackson Glacier Overlook to Lake McDonald via Gunsight and Lincoln Passes. Along the way are two choice lakes that make this one of the most popular overnight trips in the park. It caught our attention for it’s excellent trout fishing. So we climb on board the bus and ride an hour up the Going-to-the-Sun road to the Continental Divide and Logan Pass at 6626 feet. Along the way we stop frequently to pick-up other hikers headed into the backcountry. We huddle in the Visitor’s Center at Logan Pass to escape the chilly 40 degree weather. It is cloudy this morning and Logan Pass is significantly cooler than Apgar. After 45 minutes and a brief tour of the interpretive center, our bus transfer arrives. Once again we are riding along the Going-to-the-Sun road toward the trailhead at Jackson Glacier Overlook. By 10:45 am, we are on the trail and headed 6.2 miles to Gunsight Lake. The hike loses elevation as it follows Reynolds Creek then climbs about 500 feet to the lake. We stop briefly at Deadwood Falls, then turn southwest along the Saint Mary River. 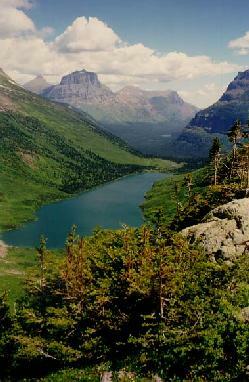 Gunsight Lake is the primary water source for the river and the lake is one of over 650 in Glacier National Park. Glaciers (and thus the name) carved this area during the last Great Ice Age. They left many of the park’s lakes upon their retreat. Glacier National Park currently has 48 glaciers and 114 miles of trails that circle and cross them. The park was created in 1910 and joins with Canada’s Waterton Lakes National Park to form Waterton/Glacier International Peace Park. 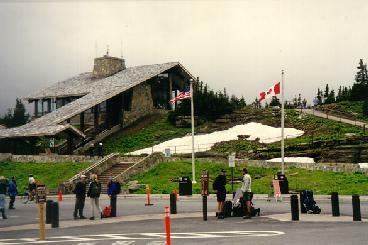 It was established in 1932 and runs along the Upper Waterton Valley following the Rocky Mountains from the U.S. to Canada. Fur trappers who visited in the mid-1700’s were reported to be the first white inhabitants of the area. 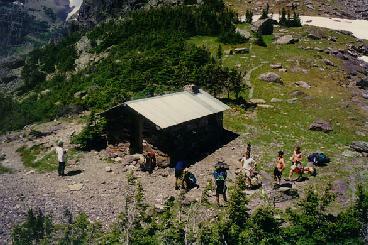 Now hikers and backpackers are the primary backcountry visitors. Surprisingly, of the estimated 2 million people who visit the park annually only about 22,000 stay overnight in the backcountry. Do they all go to Gunsight Lake? On this trip it certainly seems so. The climb from Gunsight Lake to Deadwood Falls is an easy 500 foot ascent. The views are spectacular when we emerge from the dense valley and climb into the alpine meadows above. At Gunsight Lake we find more campers than campsites. The Park Service requires a permit to camp here, but the process does not seem to be effective today. I awake from an afternoon nap to see a guy hovering over my tent. “Can I see your permit please?” he asks. I hand it over to him thinking he’s a ranger. It turns out he is a backpacker just like me, but he arrived late in the day when all the campsites were taken. The guy scans my permit briefly, sees I’m legitimate, then heads down to question our neighbors. As evening approaches, wildlife invades the area. Red Eye notices a mule deer a few yards from our tent. We snap some pictures then rig up our fly rods to test the waters for trout. Glacier is home to many a critter: wolves, mountain lions, mountain goats, bighorn sheep, elk, whitetail and mule deer, hoary marmots, black & grizzly bear. Grizzlies, however, get the most attention and for a good reason. After watching the mandatory park video that among other things provides a to-do/not-to-do list on bears, we discover that a park employee was stalked, attacked, and killed less than two months earlier as he hiked solo in the park. The park service later terminated the offending bears (a sow and two cubs) near Two Medicine Campground. Still, the event gets our attention. As Red Eye, The Ox, and I leave the campsite for the far side of the lake, we scan the brush for any signs of wildlife. Red Eye and I climb the ridge toward Gunsight Pass, but The Ox opts to cut down the bank to the southwestern side of the lake. We watch as he reaches the bank and casts his fly line. He hooks a fish then loses it. I take my eyes away for a moment to glance at the trail above. It appears that there are some critters on it. They’re too far away to identify, but definitely moving toward us. Red Eye sees them too and we wish we had the binoculars with us. As they get closer, they look like three bears lumbering down the trail. We yell down at The Ox, and tell him to head back to camp. He heeds our advice, and in the process thrashes his knees and legs while racing through the thick brush and open water. It turns out that the beasts are no more than mountain goats. The Ox is somewhat pissed as a result but seems to get over it as we dine on a hearty evening meal. 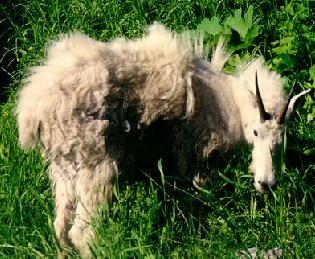 The following morning, we pass the mountain goats again as they graze by the lake. A couple of their relatives greet us on the hike to Gunsight Pass. A few snowfields do as well. Ice axes are a definite plus here, but we’re without so the going is slow and sometimes a little nerve racking. One false move and it’s a hell of a ride to Gunsight Lake sitting 1500 below. We reach Gunsight Pass (6946 feet) around noon and explore a small emergency cabin that sits nearby. During bad weather this would undoubtedly be a great hide out but we have sunny skies today. So we gaze out at Gunsight and Ellen Wilson lakes and settle into a lunch of jerky and cheese. 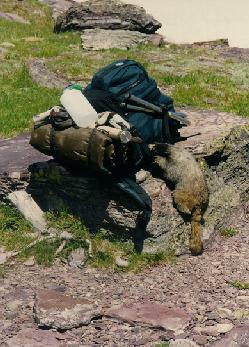 The resident population of marmots joins us, and they scurry around our break spot and check out our gear. One grabs The Ox’s t-shirt as it sits on a nearby shrub. A tug-of-war ensues, but The Ox wins the battle somewhat effortlessly. The hoary marmot seems determined however and succeeds in leaving his mark on the shirt. A small hole appears at the bottom and the marmot makes repeat efforts to re-inflict damage and score the sweaty, pungent prize. Fifteen minutes later, an invasion of backpackers and day hikers arrive at Logan Pass. The marmots lose interest in us and lay siege to the new group of visitors. We leave the foray and retreat to Lake Ellen Wilson 1.7 miles and 1000 feet in the valley below us. It is hot by now and in the 80’s – a swim in the lake is in order. We shout loudly as we jump into the water.“Whoa, that’s cold!” The Ox checks his water thermometer – 49 degrees. The swim lasts all of two minutes as a result and we sun ourselves on the warm rocks watching backpackers descend toward us. The National Park Service just opened the lake to camping and many of these hikers were lucky enough to score a permit for the night. Not us though. So The Ox, Red Eye, and I push on and hike 2.3 miles to Sperry Campground. We make our final climb to Lincoln Pass at 7050 feet, and I collapse in the late afternoon heat. It’s all down hill from here fortunately, and the hike to Sperry is a cruise. We pitch camp, then head down to check out the Sperry Chalets. The area is closed for construction, and we learn through the guidebook that waste disposal problems are the reason. It looks like an interesting area though and one of the buildings is perched on a ridge that overlooking Lake McDonald and the valley below. Back at camp the mosquitoes are out in force. I haven’t seen swarms like this since a trip to Alaska in 1995. The Ox, Red Eye, and I cover our bodies with clothing and DEET. It’s marginally effective and we hover over our Whisperlite stoves for some additional relief. Nonetheless, the mosey invasion encourages us to beat a hasty retreat to our tents. By 10:30 pm, I am snug in my sleeping bag. 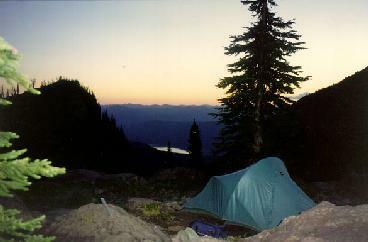 I watch from my tent as the last of the twilight disappears above Lake McDonald. Tomorrow we plan to hike the remaining 6.4 miles down 3432 feet and to the Lake McDonald Lodge. From here it should be an easy hitch back to our car. At least we hope so anyway. Click the Gunsight Pass destination page for access to photos, maps, and a trip report on this hike. For more backpacking trips in the State of Montana, follow this link.